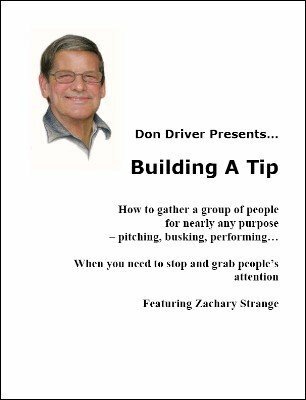 Vital knowledge and an essential skill for buskers, pitchmen, or anyone who wants to gather a crowd Don Driver reveals the exact construction and presentation of how he built tips in Las Vegas for a highly successful jam auction, stopping people on the streets and holding them. This DVD has actual footage of Don working this on Hollywood Boulevard as well as the bally being done by street performer Zachery Strange. A tip in pitchman parlance is a group of people that has stopped to look what all the fuss is about, and who is ultimately ready to be pitched to and buy products. I spent my first month and a half busking having little to no clue as to how to gather a crowd and start my show. A good 25% of every hour I spent standing around trying to get people's attention. Among the vast amount of study material I bought with my earnings on the street, I purchased this video. It looked too simple. Don just... gets a crowd. A big crowd. Just like that. I wrote down notes from Zachary Strange's excellent analysis on how the bally is constructed and modified it to fit my personality. The first day I went out after studying this video, I made $45 more than I usually do. I spent a minute to get people to stop and watch before getting my show started. This video more than paid for itself the first time I used the concepts taught. A must buy for any street performer.